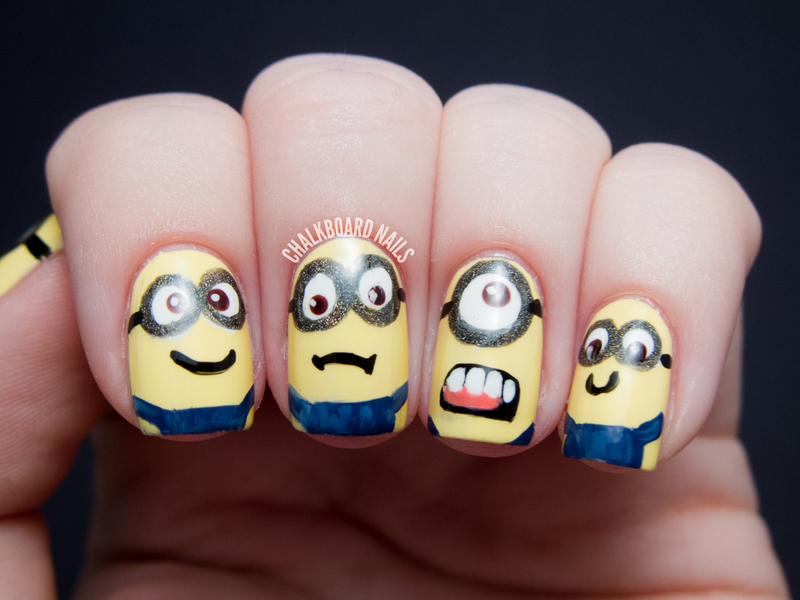 Last weekend I went to go see Despicable Me 2 with my sister, and I just couldn't resist doing minion nail art! I have seen so many cute minion nail designs (most recently from Rebecca Likes Nails, though I don't think she has posted them up yet) and I knew I wanted to try one out for myself. I had a lot of fun assembling the pieces for each of their faces -- eyes (both placement and quantity), mouth, general expression -- they are all unique! For those of you unfamiliar with the minions, here's a good YouTube montage of minion clips. The minions are basically the main character's creations, and he uses them to help him execute his evil plans. They like to goof off though, and are a huge part of the comedy in the movies! Very endearing. 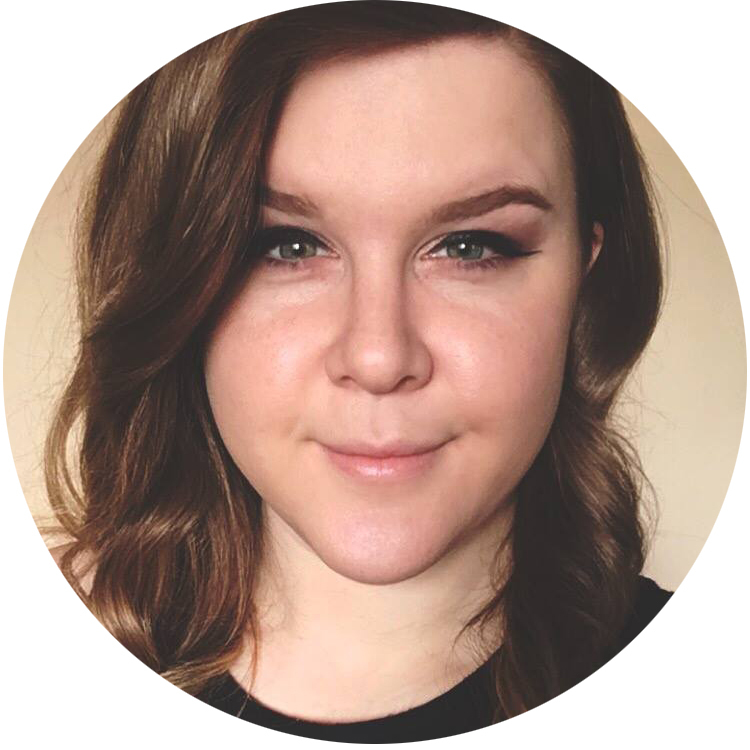 For my version, I started with a base of Lime Crime Crema de Limon. Then, I added the eyes in white, and the irises in China Glaze Call of the Wild. I outlined the goggles with A England Fated Prince and added the strap in black. The tongues are done with Zoya Renee. Lastly, I added their overalls in American Apparel Mount Royal, and distressed them a bit with China Glaze Secret Peri-winkle. The movie turned out to be really cute, and I liked knowing I was watching it with my own little minion buddies! Plus, we went and got Dairy Queen afterwards... Choco Cherry Love Blizzard! 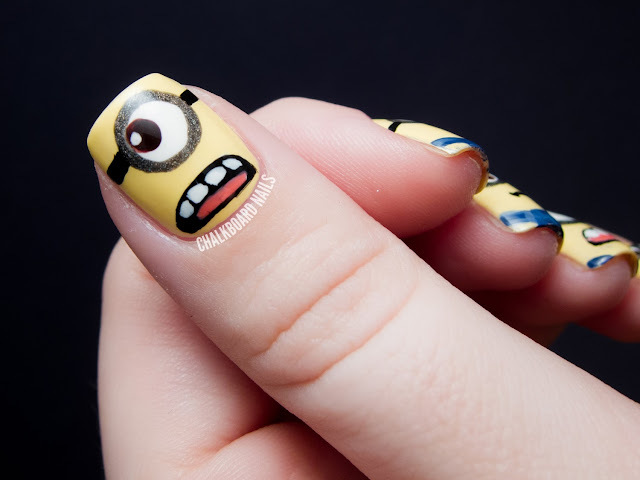 Have you seen Despicable Me 2 yet? ahh these are super cute! I saw the movie a few weeks ago and loved it....a few of my friends and I plan on being minions for Halloween, but after seeing DM2, we can't decide if we want to be yellow or purple! I LOVE despicable me, when I first started watching it I thought I was going to hate it but its ended up being one of my favourite films. Me and my friends went to go and see the 2nd one the other day ad we loved it! So funny and so cute! 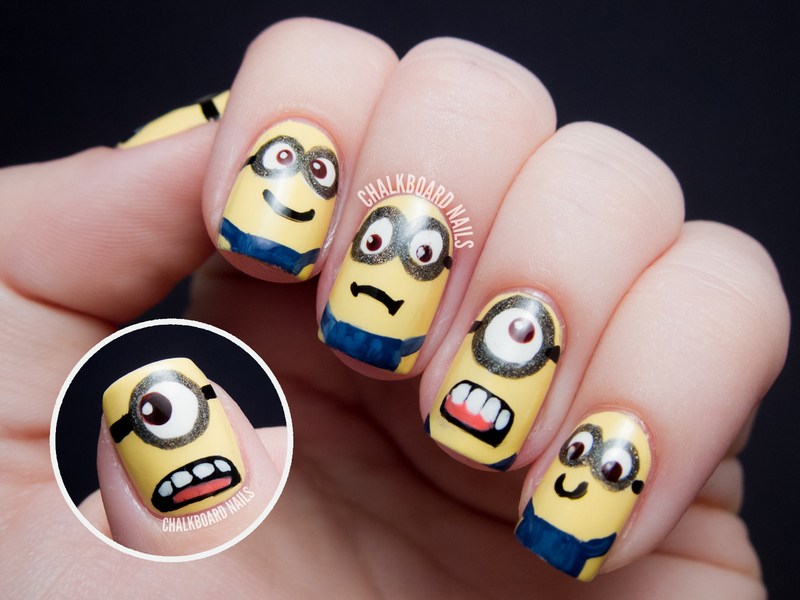 oh my gosh you put my minion nails to shame!! haha wow. I especially love the polish used to outline their eyes. Your minions are perfect! I need to see the second movie since I loved the first. So cute! 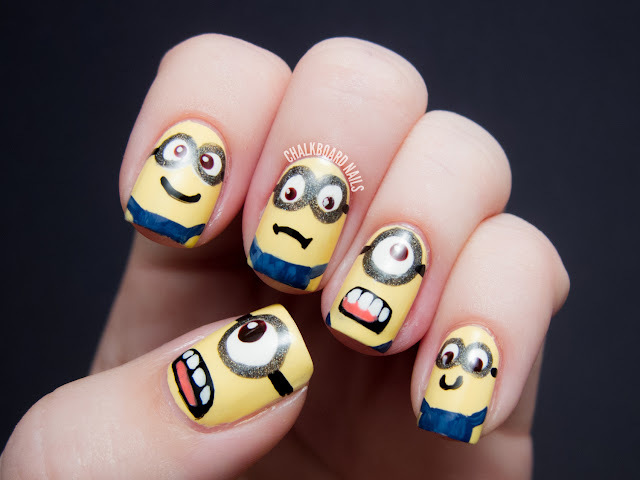 I love the minions so much! 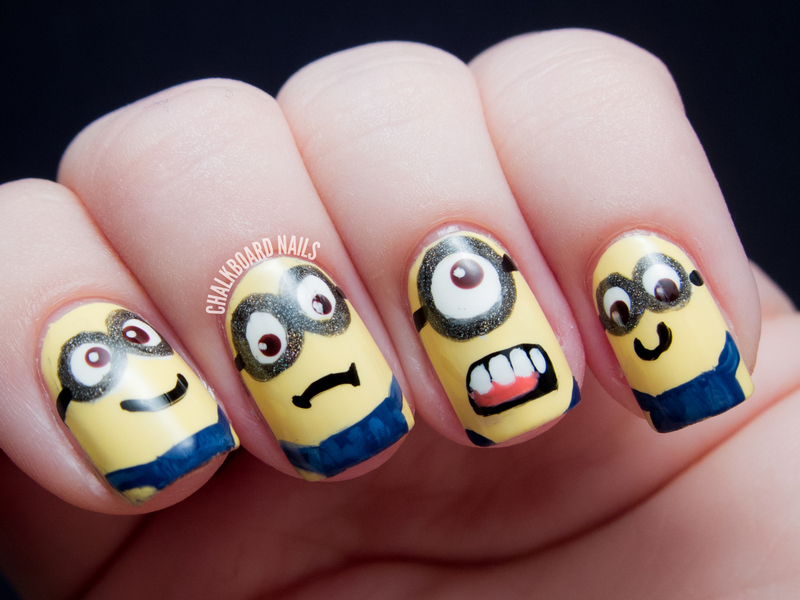 The nails are adorable, and thanks for the minion YouTube clip! TOO CUTE! 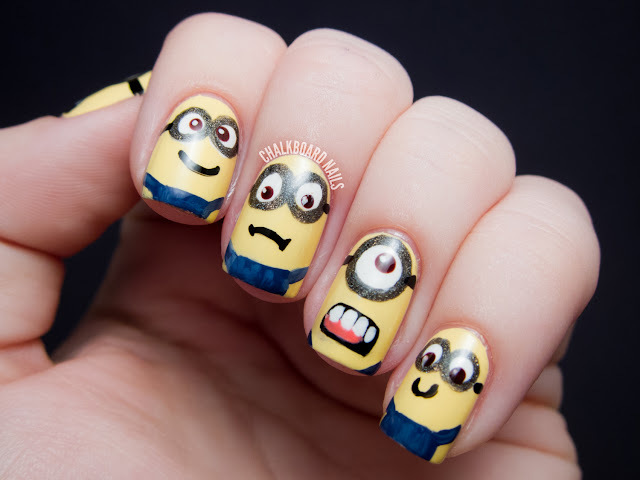 I've been obsessed with the minions since the first Despicable Me but I haven't tried to recreate them on my nails yet...I might be a little scared that I couldn't do their minion-ness justice! Omg, this is so amazing! HAHA I love the Minions! So many people are doing them but I think these are my favorite! Well done! SO CUUUUUUTE! 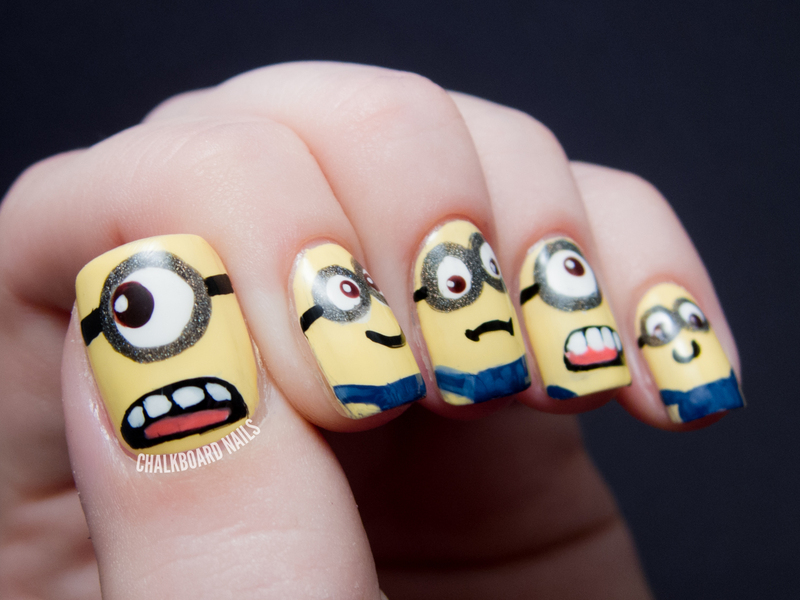 I love the minions ♥. So cute! I love the minions. Entertainment with one day of hard work. did nail arts in their Nail..
What about your right hand? I'm right handed and I'm a perfectionist and don't want my right hand to be painted and look like crap. Lol. Tapes are easy. But is that meant to be a minion? I dont want one awesomely painted hand and one plain. I hate that my left hand isn't as good. I appreciate the help! I just wish my lefty could be more perfect like my right. Lol. And right?! That'd be so convenient. Lol. I can't seem to find your link for the nails that looked gory. Can you help me? I'm not sure what you mean, sorry! Could you clarify?